Patients seeking laser hair removal expect a trusted, experienced professional, and that’s exactly what they get at Laser Hair Removal of Milford, Connecticut. After a complimentary consultation where a specialist will assess your specific needs, a board-certified physician will perform the procedure. The Laser Hair Removal clinic in Milford houses the Gentle YAG laser, which Consumer Reports calls one of the top cosmetic tools on the market. 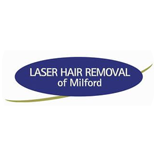 Milford’s laser hair removal technique uses the power of laser light to deactivate the hair follicle. Say goodbye to five o’clock shadow, stubble, and razors for good! Laser hair removal is a worthwhile cosmetic treatment for both men and women looking to save time and improve their appearance. Patients ecstatic about their results Laser Hair Removal of Milford have been spreading the word about this popular cosmetic destination. Don’t wait, call today and we will set up your free consultation so you can get all of your questions answered; representatives are standing by.